In Part Two of our Layers Learning Guide, take a whirlwind tour of Photoshop's Layers panel and learn the essential skills you need to benefit from all that layers have to offer! In the previous tutorial (Understanding Layers), we looked briefly at what layers are and how they make working in Photoshop so much easier. But before we can start taking advantage of all that layers have to offer, we first need to learn some essential skills for working in Photoshop's Command Central for layers—the Layers panel. In this tutorial, we'll take a whirlwind tour of the Layers panel and learn everything we need to know to get up and running quickly. I'll be using Photoshop CS6 but everything we'll be covering is fully compatible with Photoshop CC. 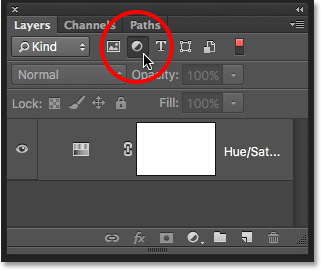 If you're using Photoshop CS5 or earlier, you can follow along here or you can check out the original version of our Layers panel tutorial. The Layers panel is where we handle all of our layer-related tasks, from adding and deleting layers to adding layer masks and adjustment layers, changing layer blend modes, turning layers on and off in the document, renaming layers, grouping layers, and anything else that has anything to do with layers. 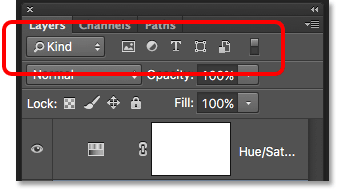 Since it's one of the most commonly-used panels in all of Photoshop, Adobe set things up so that the Layers panel opens automatically for us each time we launch the program. 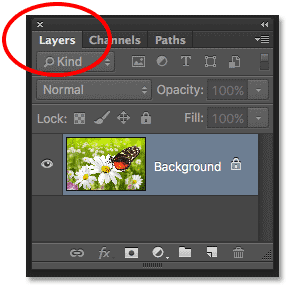 This tutorial is Part 2 of our Photoshop Layers Learning Guide. 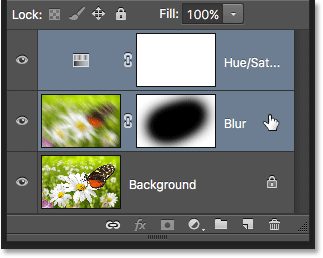 The Layers panel is highlighted in the lower right. 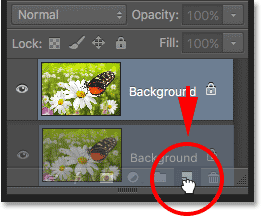 All of Photoshop's panels can be turned on or off from the Window menu in the Menu Bar. A newly-opened image in Photoshop. The name tab tells us we're looking at the Layers panel. The Channels and Paths tabs appear to the right of the Layers tab. These are two other panels that are grouped in with the Layers panel. There's so many panels in Photoshop that fitting them all on the screen while still leaving room to work can be a challenge, so Adobe decided to group some panels together into panel groups to save space. To switch to a different panel in a group, simply click on the panel's tab. The tab of the panel that's currently open in the group appears highlighted. Don't let the fact that the Layers panel is grouped in with these two other panels confuse you, though. 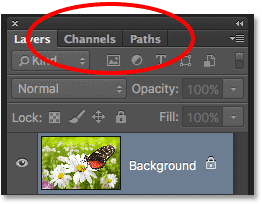 The Channels and Paths panels have nothing to do with the Layers panel, other than the fact that both are also commonly used in Photoshop, so we can safely ignore them while we look specifically at the Layers panel. The Layers panel displays layers as rows of information. 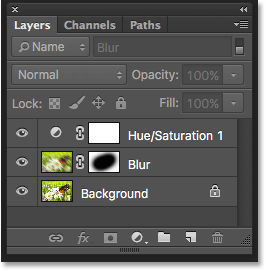 The Layers panel displays the name of each layer. The preview thumbnail shows us what's on each layer. 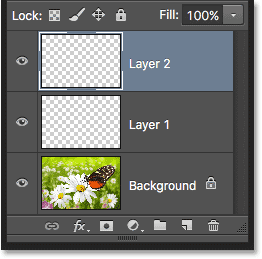 A new layer named Layer 1 appears in the Layers panel. When we add a new layer to a document, it begins life as a blank slate. 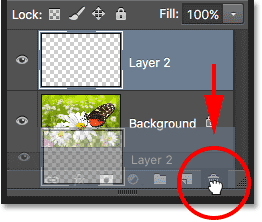 Clicking a second time on the New Layer icon. Three layers, each on its own row in the Layers panel. 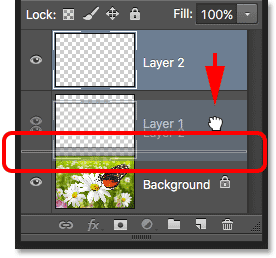 To move a layer, click and drag it above or below another layer. Layer 2 now sits between Layer 1 and the Background layer. 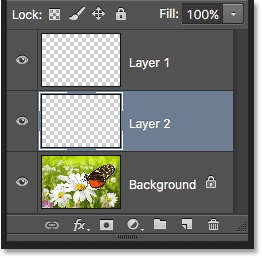 The only layer we can't move in the Layers panel is the Background layer. We also can't move other layers below the Background layer. All other layers can be dragged above or below other layers as needed. Again, we'll cover the Background layer in much more detail in the next tutorial. You may have noticed that when I only had the one Background layer in my document, it was highlighted in blue in the Layers panel. Then, when I added Layer 1, Layer 1 became the highlighted layer. And now Layer 2 is the highlighted layer. What’s up with the highlights? Layer 1 is now the active layer in the document. Delete layers by clicking and dragging them into the Trash Bin. Dragging Layer 2 into the Trash Bin to delete it. 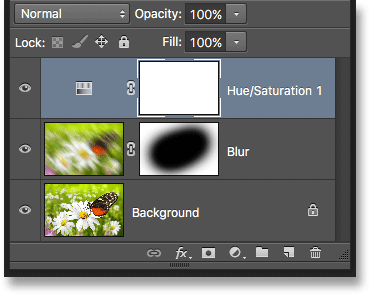 The two blank layers have been deleted. Dragging the Background layer onto the New Layer icon to make a copy of it. A copy of the layer is placed above the original. 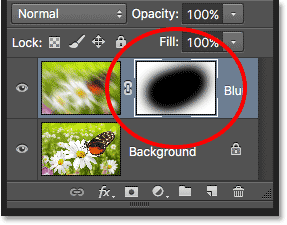 I'm going to quickly apply a couple of Photoshop's blur filters to my Background copy layer just so we have something different on each layer. 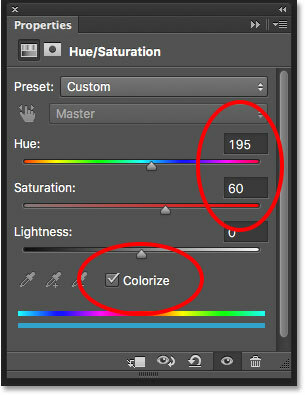 Since Photoshop's filters are beyond the scope of this tutorial, I'll go through these steps fairly quickly. 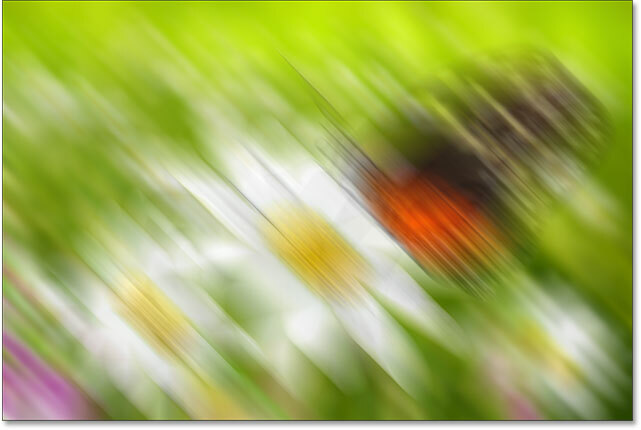 The Motion Blur filter's dialog box. The effect after applying the Motion Blur filter. 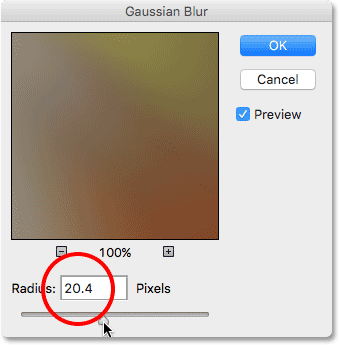 The Gaussian Blur filter's dialog box. The effect after applying the Gaussian Blur filter. 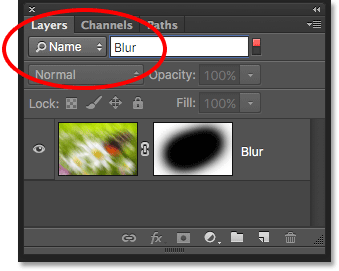 It may look like I've blurred the entire image, but if we look in the Layers panel, we see that's not the case. Since the Background copy layer was the active layer when I applied the blur filters, only the Background copy layer was affected. The preview thumbnails now show very different images on each layer. 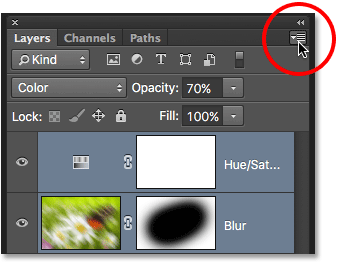 Click the layer visibility icon to turn a layer off in the document. 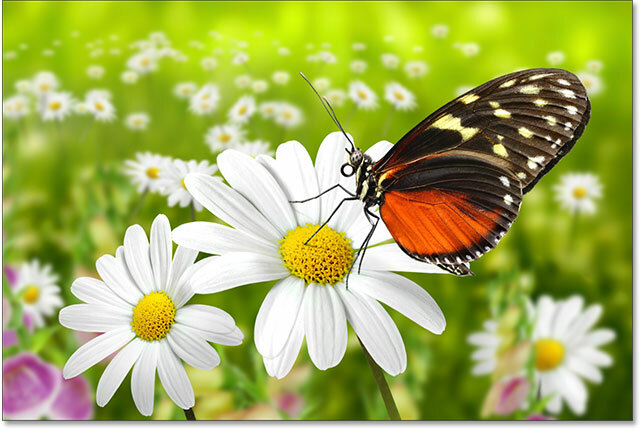 The original image reappears in the document. The layer visibility icon appears empty when a layer is turned off. 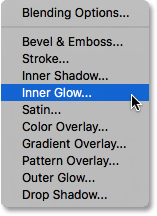 As we've seen, Photoshop automatically names layers for us as we add them, but the names it gives them, like "Layer 1" and "Background copy", are pretty generic and not very helpful. When we only have a couple of layers in a document, the names may not seem very important, but when we find ourselves working with 10, 20 or even 100 or more layers, it's much easier to keep them organized if they have meaningful names. 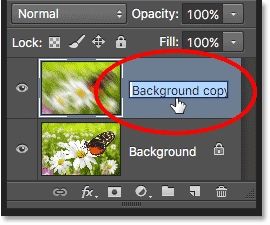 Renaming the "Background copy" layer. The "Background copy" layer is now the "Blur" layer. Add a layer mask by clicking the Layer Mask icon. A layer mask thumbnail will appear to the right of the layer's preview thumbnail, letting you know that the mask has been added. Notice that the thumbnail is filled with white. On a layer mask, white represents the areas of the layer that remain visible in the document, while black represents areas that will be hidden. 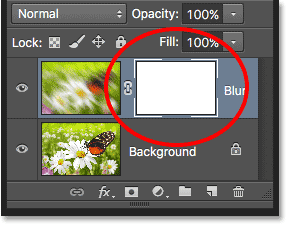 By default, Photoshop fills new layer masks entirely with white. To hide parts of the Blur layer, I'll need to paint on the layer mask with black. Photoshop uses the current Foreground color as the brush color, so before I start painting, I'll make sure my Foreground color is set to black. 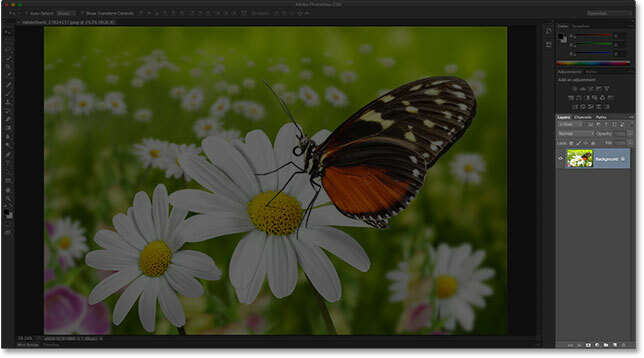 Painting with black on the layer mask to hide areas of the Blur layer. The layer mask thumbnail after painting with the Brush Tool. If everything we just did there was brand new to you, don't worry. Layer masks are a whole other topic, and I explain them in much more detail in our Understanding Layer Masks in Photoshop tutorial. 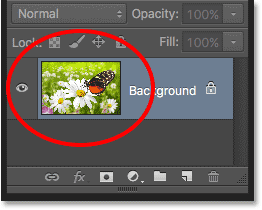 The New Fill or Adjustment Layer icon. 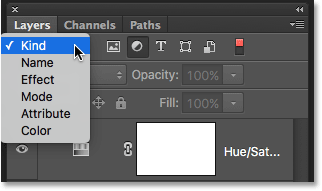 The Properties panel (CS6 and CC). 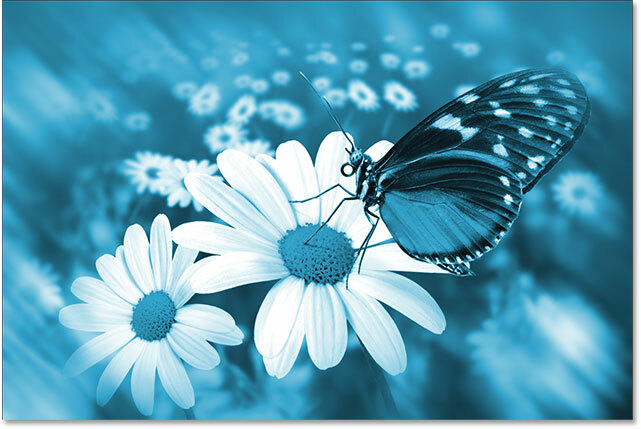 The image after colorizing it with a Hue/Saturation adjustment layer. The Layers panel displays any fill or adjustment layers we've added to the document. 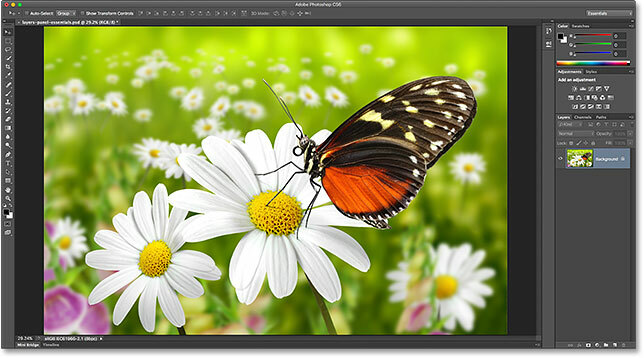 You can learn more about Photoshop's adjustment layers in our Non-Destructive Photo Editing With Adjustment Layers tutorial and our Reducing File Sizes With Adjustment Layers tutorial, both of which are found in our Photo Editing section. 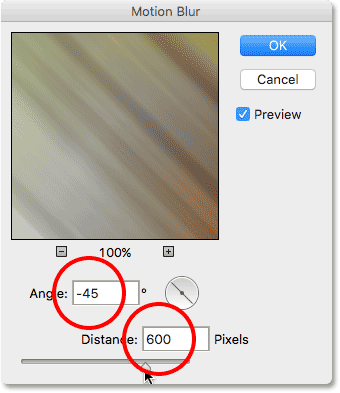 The Layers panel is also where we can change a layer's blend mode, which changes how the layer blends in with the layer(s) below it. 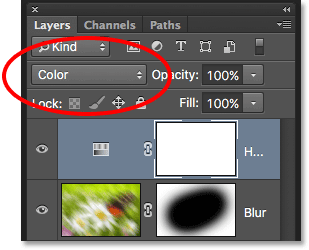 The Blend Mode option is found in the upper left of the Layers panel directly below the name tab. 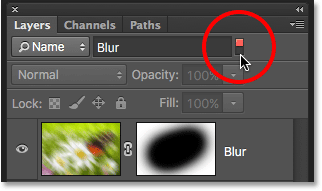 It doesn't actually say "Blend Mode" anywhere, but it's the box that says "Normal" in it by default. Changing the blend mode of the active layer. 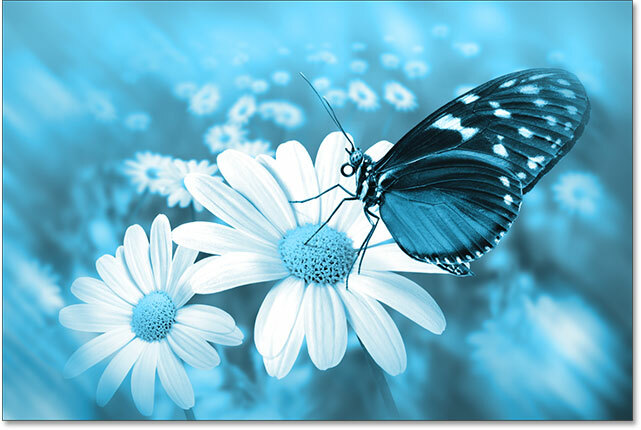 Only the colors in the image are now being changed. The brightness values are unaffected. 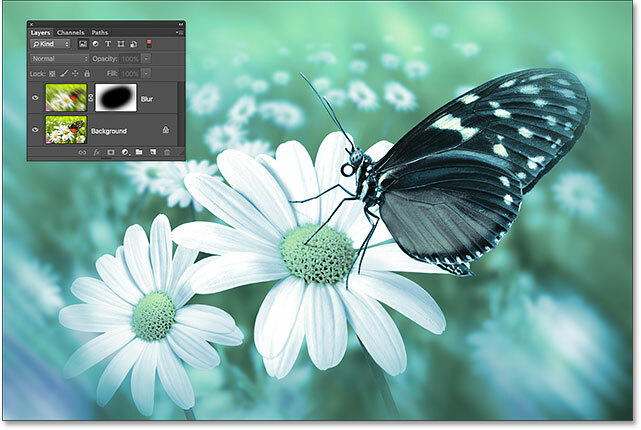 To learn much more about Photoshop's layer blend modes, including the Color blend mode, be sure to read our Five Essential Blend Modes For Photo Editing tutorial. The Opacity option controls a layer's transparency level. The original colors now partially show through the adjustment layer. Directly below the Opacity option is the Fill option. 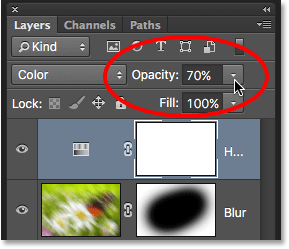 Like Opacity, Fill also controls a layer's level of transparency. In most cases, these two options (Opacity and Fill) behave exactly the same way, but there is one important difference between them that has to do with layer styles. Again, we won't get into the details here, but to learn the difference between Opacity and Fill, check out our Layer Opacity vs Fill tutorial. Selecting both layers at once. 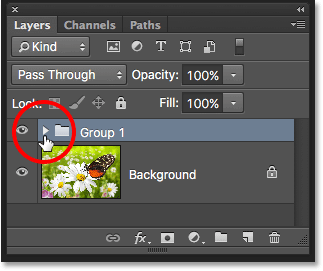 Choose "New Group from Layers" from the Layers panel menu. 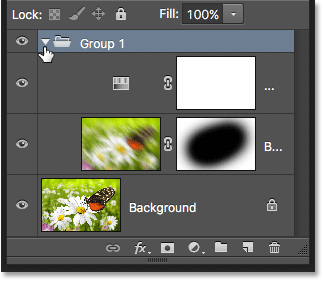 The New Group from Layers dialog box. The two selected layers are now hidden inside the group. Click the triangle to open it. Layer groups are great for keeping things organized. Choosing the "Delete Group" option. Choose "Group Only" to delete a group but keep any layers inside of it. The group is gone but the layers remain. 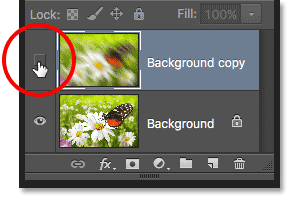 There's lots of things we can do with layer groups in Photoshop. To learn more, check out our Layer Groups tutorial. 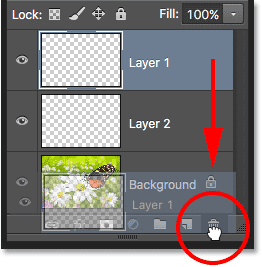 The Layers panel also gives us a few different ways that we can lock certain aspects of a layer. For example, if part of a layer is transparent, we can lock the transparent pixels so that we're only affecting the actual contents of the layer, not the transparent areas. Or we can lock all of the pixels, whether they're transparent or not, to prevent us from making any changes at all to the layer. We can also lock the position of the layer so we can't accidentally move it around inside the document. The four layer lock options. A small lock icon indicates one of more aspects of the layer is locked. 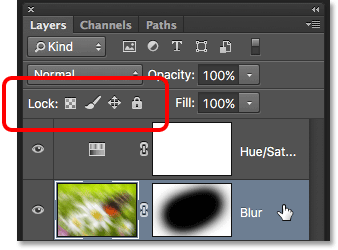 The Search feature was added to the Layers panel in Photoshop CS6. The Search Bar allows us to quickly filter through the layers in a multi-layered document to find a specific layer, view only certain types of layers, or view only the layers that match certain criteria. To use the Search Bar, choose a filter type from the drop-down box on the left. By default, the filter type is set to Kind, which means we'll be asking Photoshop to show us only a specific kind of layer. Depending on which filter type you've chosen, you'll see different options to the right of the filter type box. With Kind selected, you'll see a row of icons, each representing a different kind of layer. From left to right, we have pixel layers, adjustment layers, type layers, shape layers, and smart objects. 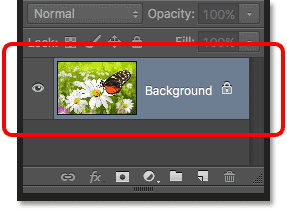 Clicking on one of these icons will filter the layers in your document and show you only the layers of that specific kind. 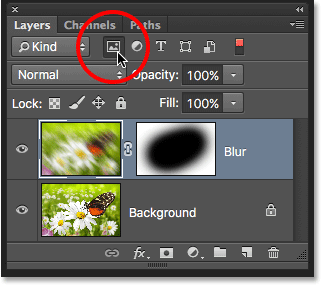 You can view two or more kinds of layers at once by clicking multiple icons. Click an icon again to deselect it and remove it from the search. Filtering the Layers panel to show only the pixel layers. 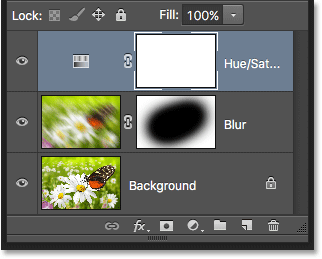 Filters layers in the Layers panel has no effect on their visibility in the document. Filtering the Layers panel to show only the adjustment layers. 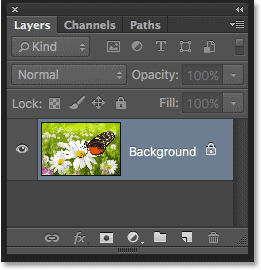 Click the Filter Type box to view all the ways we can filter our layers. We won't go through all of them here, especially since we only have three layers in our document. But as another quick example, I'll change my filtering type from Kind to Name, which lets us search for a specific layer based on the name we gave it. 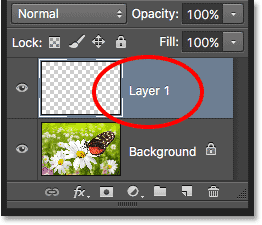 This is a great example of why it's so important to name our layers ourselves rather than sticking with Photoshop's generic names like "Layer 1" and "Layer 2". The Name option lets us quickly find a layer by searching for its name. Click the light switch to enable or disable the Search Bar. One last feature of the Layers panel that often comes in handy is the ability to change the size of the preview thumbnails. Larger thumbnails make it easier for us to preview the contents of each layer, but they also take up more room, limiting the number of layers we can see at once in the Layers panel without having to start scrolling. Large thumbnails can also cause your layer names to appear truncated since they can't fit entirely within the layer row. 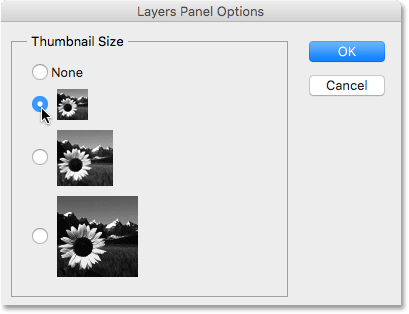 Choosing "Panel Options" from the Layers panel menu. Choose from three different sizes for the preview thumbnails. Smaller thumbnail images leave more room for more layers. And there we have it! In the next tutorial in our Layers Learning Guide, we'll look at some essential Layers panel preferences that will help us customize the Layers panel and keep it free of clutter so we can work in Photoshop more efficiently! Or view our Photoshop Basics section for more tutorials!